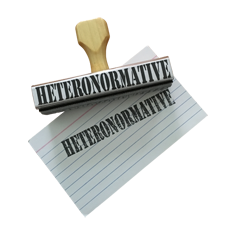 Stamp out the heteronormativity in your life! Our quality stamp with solid wooden handle that make a satisfying thump when pressed against anything you see that’s heteronormative. Image is 4 inches by 1/2 inch. Handle is 2.5 inches. Ink pad not included — pick one up at your local office supply store.